Frequency modulation is the instantaneous changing of the carrier frequency proportional to the information modulating signal. The amplitude of the information signal, which changes with time, t will change the carrier frequency while the carrier amplitude remains fixed. The carrier frequency varies linearly with the amplitude of modulating signal. The higher the amplitude of modulating signal the bigger frequency difference produced. Frequency modulation is a type of modulation where the frequency of the carrier is varied in accordance with the modulating signal. The amplitude of the carrier remains constant. The information signal (the modulating signal) changes the instantaneous frequency of the carrier. Since the amplitude is kept constant, FM modulation is a low-noise process and provides a high quality modulation technique which is used for music and speech in hi-fidelity broadcasts. In addition to hi-fidelity radio transmission, FM techniques are used for other important consumer applications such as audio synthesis and recording the luminance portion of a video signal with less distortion. There are several devices that are using FM modulation to transmit a signal that can be received by others. Thus this purpose was applied by The United States Army to produce the Spiel for Silent Sound Device which a device which takes ordinary human speaking voice and does two things to it. The United States Army connected a silent sound voice converter like this one to an FM broadcast transmitter, broadcasting on a frequency of 100 Megahertz, and the silent hypnotic commands were carried right on top of normal voice in the Iraqi language. The normal voice carried confusing information, while the SILENT component re-enforced a sense of despair by hypnotic suggestion. This technology was used in actual military combat in the 1991 Gulf War. The successful use by the U.S. Army clearly shows that this technology does work. This technology was success with transmission of speech directly into the human skull with no receiving device. 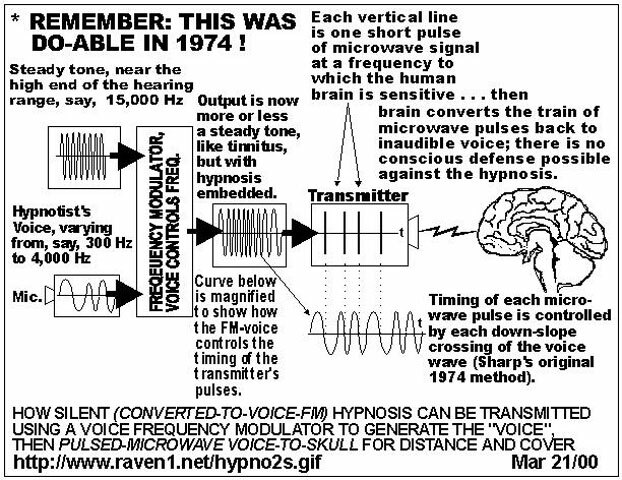 By connecting this "silent sound" device to a voice-to-skull transmitter, it is possible to transmit hypnotic phrases silently into a target's bedroom, every night, for years, without the target's being aware. Through-the-wall voice-to-skull technology makes it almost inescapable. Skull Projector, an application of frequency modulation is applied which is it converts from natural AM to FM which this garbles the voice and raises the average frequency from around 1,500 Hertz, which is normal, to around 15,000 Hertz. By using FM, we are able to hypnotize or programs an individual to gain some beneficial. But, need to remember, this application of FM to human can do damages to human’s brain. It becomes very invasive and dangerous, though, if connected to a voice-to-skull projector. It can also do severe damage to a person well being.